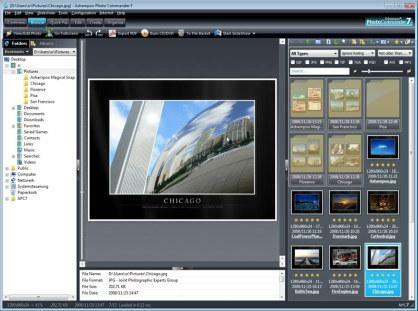 Ashampoo Photo Commander is a comprehensive photo-editing suite that able to manage, view, editing, picture organization, image presentation, and photo sharing. Ashampoo Photo Commander comes with easy-to-use interface that suitable for both proficient and novices. In addition, Ashampoo Photo Commander also can be used to remove the red-eye effect, adjust colors, contrast, hue and many other parameters, or resize, crop, rotate, and add a wide range of special effects. Furthermore, the software has added tons of features such as 3D hardware acceleration for a big speed boost, stitch images to create panorama, and advanced media search features. An email from Ashampoo <MrReg@ashampoo.com> will be sent with a conformation link. Click on the confirmation link, and user will be automatically directed to a web page where he or she needs to fill in the name and other information.Note: If you already registered an account with Ashampoo before, login, and then just click on conformation link, then you will be directed to your Personal Ashampoo Account Page or receive email with license key. Upon completed registration, Ashampoo will send another email that contains Ashampoo Photo Commander 7.31 registration key. 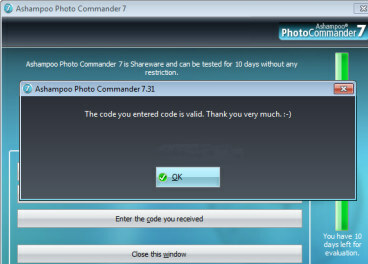 Install Ashampoo Photo Commander 7.31 and enter the license key to enjoy the free full app. 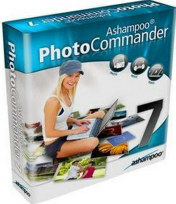 Note: Ashampoo Photo Commander 7 (latest version English setup installer is available for download) is also available free as part of Ashampoo free gifts promotion.